Amy's Crazy Crafts: After the Farm Battle! Front of barn and house. 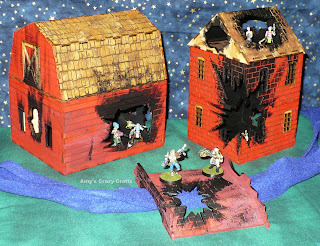 I added battle damage to the Farm House, Barn and Bridge. The only "bad" thing about this set is I did not paint the back of the doors which can be seen in the pictures. I tried to choose pictures where this over sight is not too obvious. I also painted the interior all black, so it is hard to see some of the damage. 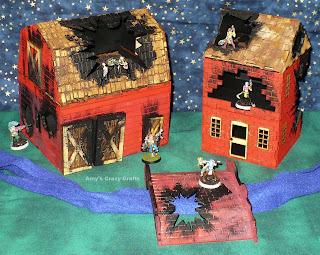 Extra glue may be needed on the barn roof due to the missing/damaged roof pieces to keep it together. 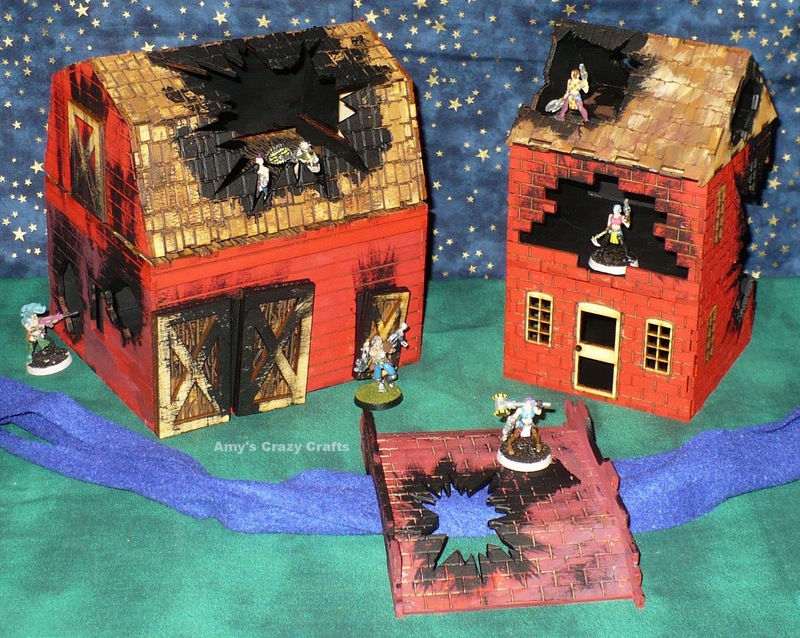 Notes on this design: Paint the inside of the farm house roof before gluing together, it is way easier! Do not bother spending a lot of time getting the loft of the barn's wood "just right" if you will end up painting it black in the end. I also installed the loft backwards when I painted it, the access hole is over the double doors (front left) and was suppose to be in the back right corner. Not a big deal, but something to look out for. I could rotate the loft but then my burnt paint lines would not match. I had fun putting the doors together and painting them. I was trying to make it look like a small bomb went off in the barn, just barely blowing the doors open. I did not detail both sides of the bridge in the picture but will for the final product. Improvements to the barn: I removed the extra attachment holes that were not used in the previous design of the barn. The roof now is held on by four plugs instead of 8 to make it easier to line up and assemble. Back of barn and house. Deluxe Set + Damaged Basic Set: Unfinished two level farmhouse, barn, outhouse, fence, three small bridges, one medium bridge, one large bridge, windmill, greenhouse, trees. 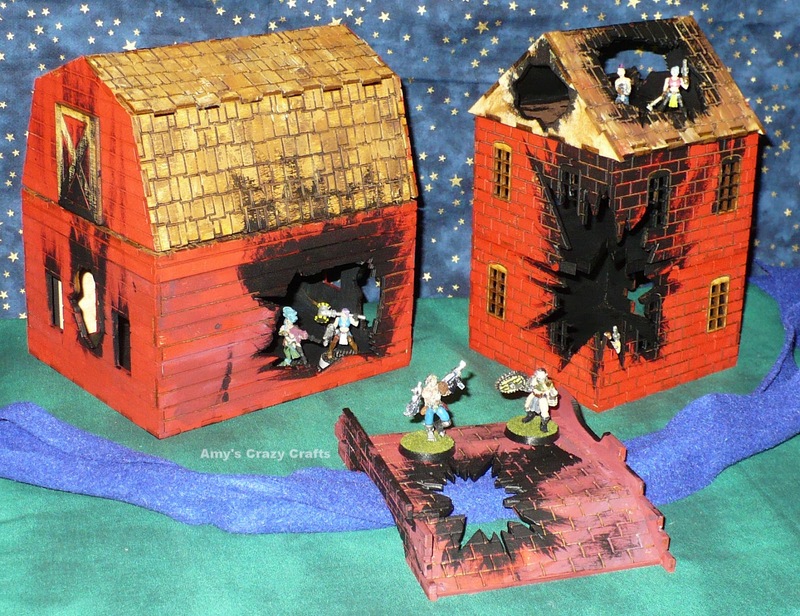 Plus damaged & unfinished two level damaged farmhouse, damaged barn, and medium stepped damaged bridge! Deluxe Set: Unfinished two level farmhouses, barn, outhouse, fence, three small bridges, one medium bridge, one large bridge, windmill, greenhouse, trees. Standard Set: Unfinished two level farmhouse, barn, outhouse, fence, one small bridge, one medium bridge and one large bridge. We can also post these on Ebay, Etsy or Zibbet, if there is not a current posting, let me know and we will post one for you!